The most effective e-commerce marketing programs use email as a core tactic for conversion and retention, but snail mail is often ignored. Once thought to be archaic, direct mail marketing is making a comeback. There is a good reason. Direct mail works (even if a bit overshadowed by email). Hubspot took those results and calculated the ROI. The numbers speak for themselves. In the email-only scenario, for every dollar spent, $2,600 was recouped! Compare that to the direct mail-only scenario, where each dollar returned only $27. Keep in mind, that while the ROI of email is a lot higher than direct mail, direct mail still generates a positive ROI….and these numbers are for a single company. We have seen that for many companies, direct mail works extremely well as part of their marketing mix. Especially as a clutter-buster with audiences that are overwhelmed by a high volume of email communications. 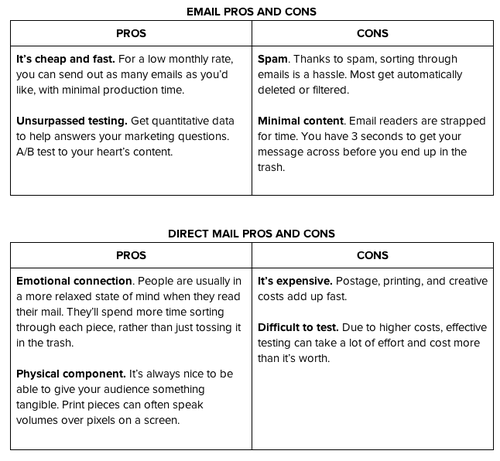 So let’s look at how Direct Marketing for e-commerce stacks up against Email Marketing. As an e-commerce tactic, email generates a significant ROI, but don’t forget direct mail. It has worked for decades and still works. After all, would a sophisticated marketer like LLBean send all the catalogs that it does, if direct mail didn’t work financially? So, test your tactics and figure out the best marketing mix for your business. Every business is different. Your e-commerce marketing strategy should be unique to yours. At Accorin, we’ve helped dozens of companies craft their marketing strategy. Let us help you with yours.